Fire on the Bluff is honored to have been in residency at Bang Brewing in St. Paul making pizzas for the past five weeks on Thursday, Friday and Saturday evenings. What a wonderful opportunity to partner with Sandy and Jay at Bang and provide our tasty organic dough pies to accompany their amazing organically brewed beer. Gorgeous Swede Hollow Park, 50+ visual and performing artists, open sculpture contest PLUS a Picnic Plaza with food trucks including Fire on the Bluff wood fired pizza, 9-YUM-YUM Ice Cream, Asian American Fusion and Come & Get It. This Saturday from 10AM-5PM. See Google Map link below for location of our Art in the Hollow Picnic Plaza by the West Entrance to Swede Hollow Park. And see you there! It's true! We're taking over Eddie Wu's fantastic diner, Cook St. The 3rd annual Art in the Hollow arts festival is happening this Saturday June 6th in St. Paul's Swede Hollow Park. 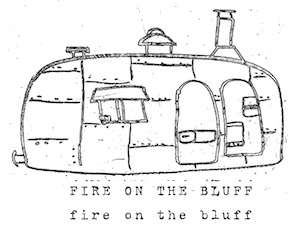 Fire on the Bluff will be there with the Airstream to bake up some tasty pizzas for sale. Technically speaking this will be our public debut. Join us!